Recently BitFenix sent a couple of packages one of which was the Raider case I reviewed, the second box was much smaller in stature and was devoid of any clues as to what lay inside. 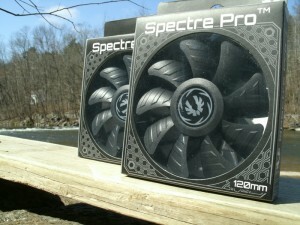 Upon opening the box I was greeted with two 120 mm Spectre Pro Fans. Their follow up to the Spectre is the now available in the form of the Spectre Pro which like the Spectre, is offered in a variety of sizes and with a variety of different colored LEDs. The sizes that BitFenix has to offer in the Spectre Pro series are the 120 mm, the 140 mm, the 200 mm, the 230 mm, and again a variety of different colors in the LED department. 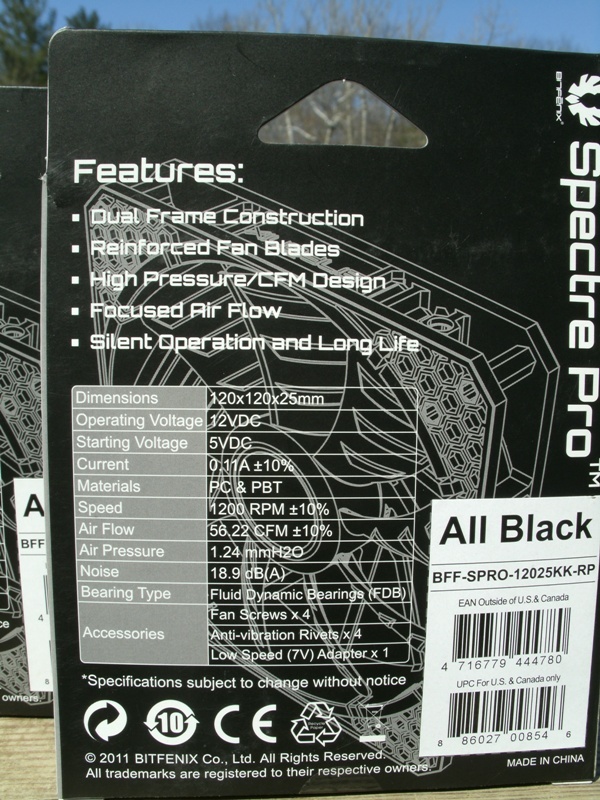 Below are some feature and specifications of the Spectre Pro. High Pressure/CFM Design – Engineered for maximum pressure and airflow, Spectre Pro delivers a torrent of air that will keep your system cool even when the action heats up. 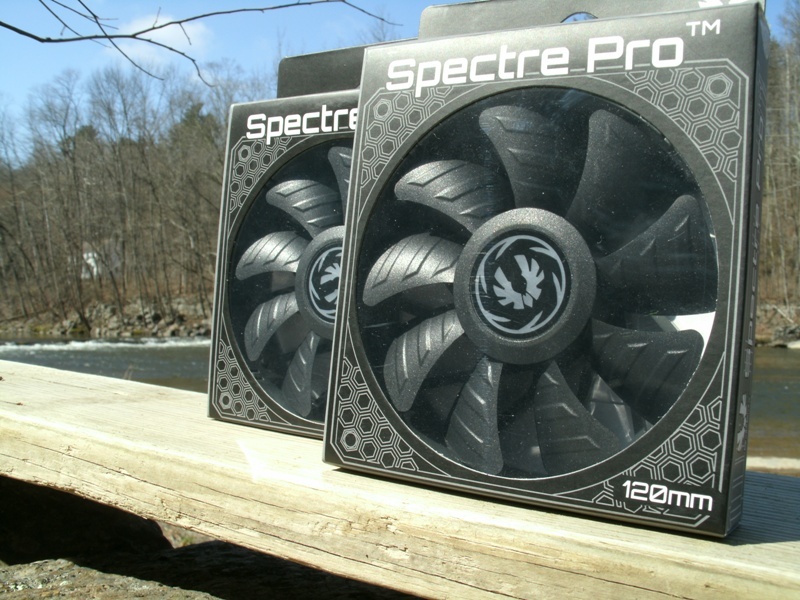 Performance freaks and water cooling enthusiasts are going to love Spectre Pro. 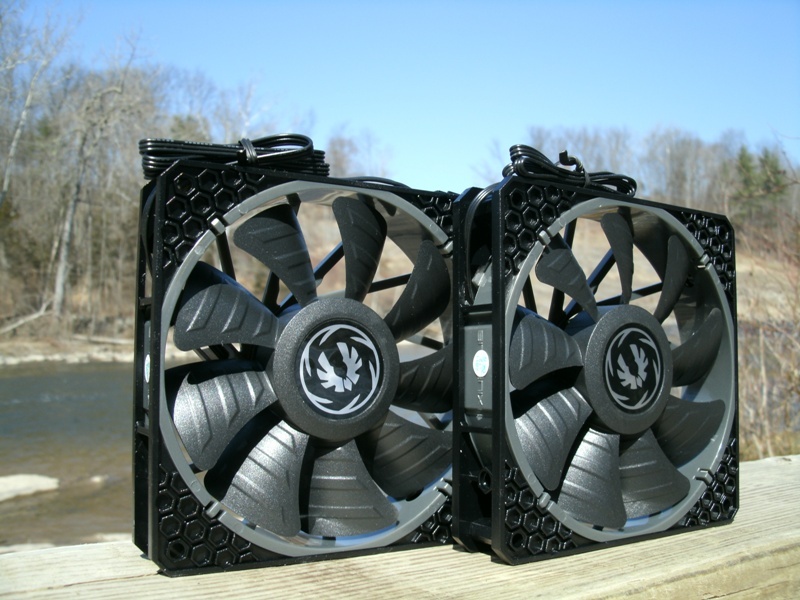 Dual Frame Construction – Using a dual frame construction, Spectre Pro fans not only offer aggressive looks, but also vibration dampening properties, helping to keep noise levels in check. In short, our Spectre Pro Fan Series looks different because it is. Reinforced Fan Blades – High rotation speeds can actually warp fan blades while in motion, resulting in more turbulence and noise. Spectre Pro features reinforced fan blades that resist warping even when spinning at high speeds for maximum cooling performance. Focused Airflow – All the airflow in the world won’t do you any good if it can’t reach your system’s hotspots. The special curved design of Spectre Pro fan blades and cage directs airflow in a focused column, minimizing diffusion and allowing cool air to reach your components. Silent Operation and Long Life – Like our Spectre™ Silent Fan Series, our Spectre Pro features the very same fluid dynamic bearing technology for minimum noise and maximum operating life. Excellent Extras – Included with each Spectre Pro fan are some thoughtful extras that help you keep noise levels as low as possible. Four Anti-Vibration Rivets help further deaden noise-making vibrations, and for even more noise control, install the included Low-Noise 7V Adapter. Get more with Spectre Pro. The packaging that these fans came in is pretty much the standard as far as fans go. 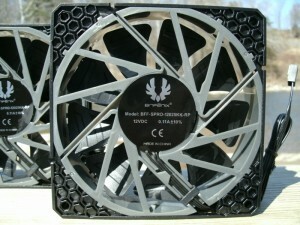 Below we will see that the front views of the boxes show a nice preview of the fan and its blades. 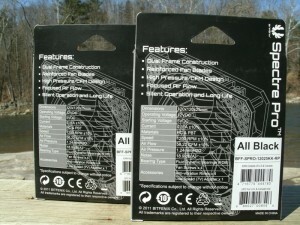 The boxes say Spectre Pro on them, have the size, and also have the BitFenix logo on the front. In this next set of pictures, we will see one shot of both of the fan boxes together and a closeup of the back of the fan box. Again, nothing out of the ordinary here, the back basically lays out some of the features and has the specifications printed on it. This next series of shots are of the fans themselves after being removed from the boxes. 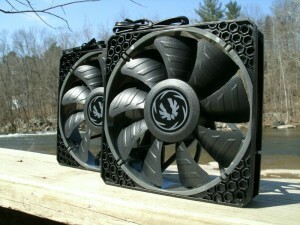 The fans themselves are actually quite nice looking. There are nine blades to each fan and on the blades there are three raised areas which is part of the Reinforcement Feature that BitFenix is offering on the Spectre Pro. The inner portion of the fan is grey in color with a smattering of silver flecks. 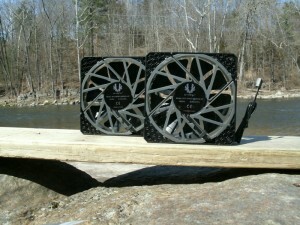 The frame of the fan is black in color, feels very solid, and has a nice honey-comb effect to it. This next series of photos shows the backside of the fans which has a sticker with the model number for the fan, voltage, amps, and the BitFenix logo. Also, in these photos, you can see the plug, which is a three-wire plug. No PWM? Well for the price point that these come in at I really can’t find any PWM fans, so again nothing out of the ordinary. One thing worth mentioning is the fact there isn’t any cable sleeving over the wires. The wires are attached to each other and really they shouldn’t separate but we all know the old adage, “If it can happen, It will happen”. This next photo shows the goodies that came along with the fan. 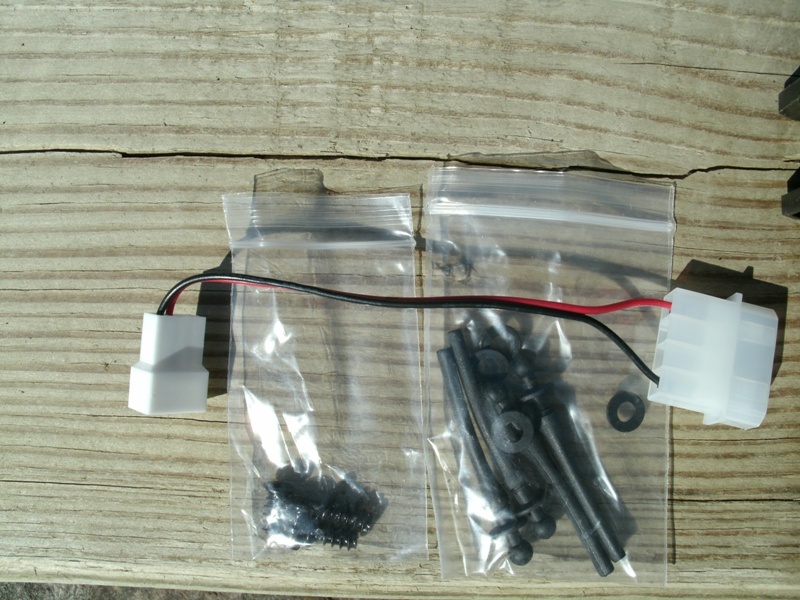 You get your standard bag of four fan screws, a bag with four anti-vibration rivets, and a 7 V adapter to really help you go silent. Testing setup – The setup that I used to test the performance of these fans out was an AMD AM3 Phenom II x4 965 overclocked to 3.7 GHz on stock volts, a Thermalright Ultra 120 eXtreme with the standard supplied AMD mount, Arctic Cooling MX-2 Thermal Compound, Asus Crosshair IV Formula, Kingwin Lazer 1000 W PSU, and everything was closed up inside of the BitFenix Raider chassis to get as close to a “real world” scenario as possible. Detailed in the graph below are my findings for degrees Celsius above ambient using the methodology posted above. For those of you that don’t know how to convert Celsius to Fahrenheit, (Like me! Well, I know now) you take the degrees Celsius multiply by 9, then divide by 5, and finally you add 32. Voila, you have you degrees Fahrenheit! The red line signifies 15 minutes of a Prime95 run, and the blue is running at idle. At idle all three come in at a tie with 12 °C above ambient. 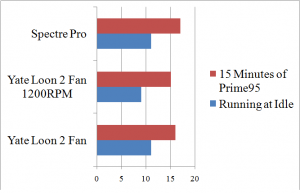 As we can see from our graph for the Prime95 runs the Spectre Pro won out with 21 °C above ambient, with the Yate Loon full out (±1800 RPM) coming in at 22 °C, and last the Yate Loon running at ±1200 RPM following everyone else in at 23 °C. 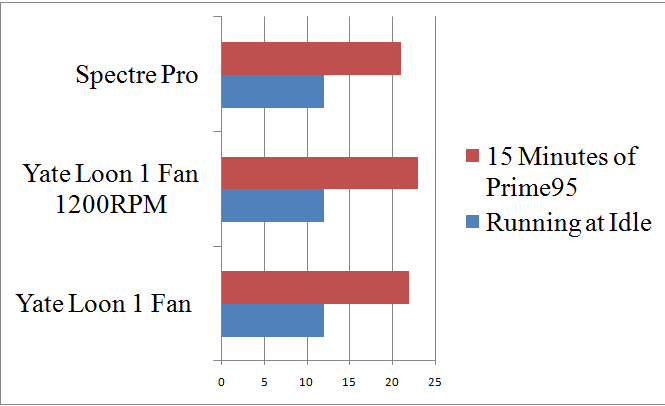 Moving into our next phase of testing which was the use of two fans set up in a push/pull configuration using the same methodology our results were again put into a graph using the same format. 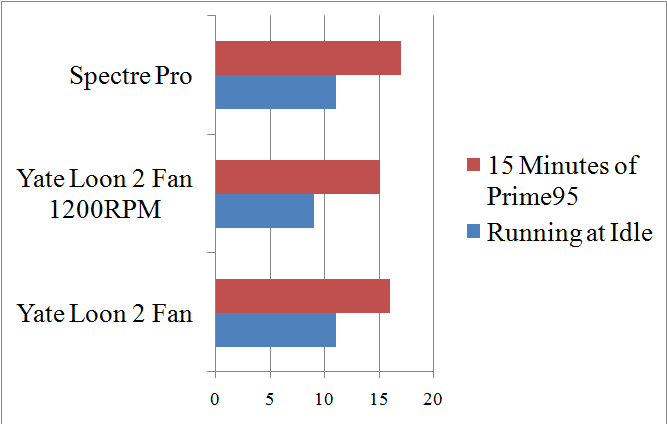 From looking at our graphed results, you can see that the Spectre Pro was not able to pull out in first for the idle test. In fact, the Yate Loons set at ±1200 RPM won out with 9 °C above ambient, with the Spectre Pro and Yate Loons full bore tying out at 11 °C. Moving into our Prime95 runs we will see that again it was the Yate Loons running at ±1200 RPM that came out on top with a temperature of 15 °C above ambient. Again, the Spectre Pro and the Yate Loons running full bore tying out at 16 °C above ambient. 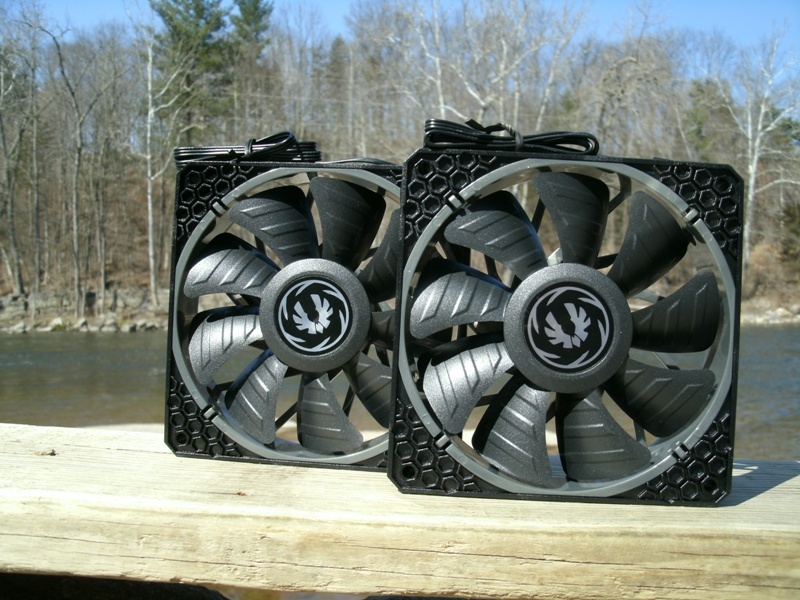 I have to say that I am very impressed with the lack of vibration from these fans. 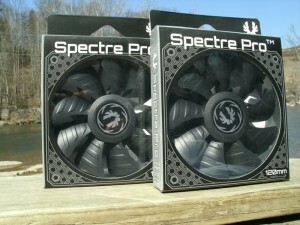 I hand held one Spectre Pro fan and spun it, twisted it, and shifted it all to no avail. There didn’t seem to be anything that I could do to get it to really vibrate. I attempted the same with one of the Yate Loons that I used to test against the Spectre Pro and I got totally different results. If the Yate Loon was placed in any orientation other then vertical or horizontal I would get almost violent vibration coming off of the fan. As far as the Spectre Pro and vibration goes, there is none! Again in the sound department the Spectre Pros win hands down. 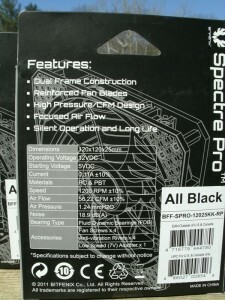 The specifications say that the Spectre Pro is rated at 18.9 dB(A). 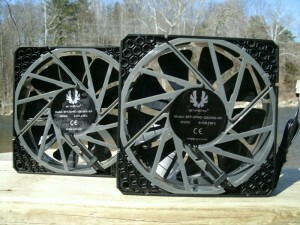 I have no instruments to use to test the sound levels for myself, however I can tell you that these fans are quiet. With two Spectre Pros running full speed inside of my case I cannot hear a thing. I generally come from a mind of if you don’t hear any noise then something is wrong. With that in mind, it was very unsettling for me to not hear anything! Unsettling enough for me to constantly go back and check my temps to make sure that everything was kosher. As far as the Spectre Pro and sound goes, there is very little to none! First off we’ll have some pros and cons about the Spectre Pro. I literally can’t think of any others! The Spectre Pros are nice to look at and easy on the eyes. Did I say that these things are quiet? I mean the Spectre Pro is QUIET! The performance that I was able to get out of the Spectre Pro was pretty much right on par, or a little above, the fans that are offered at the same price point. 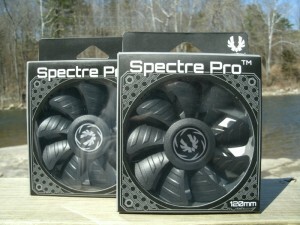 In my opinion, choosing between the Spectre Pros or another fan is going to come down to sound. Now that I have gotten used to not really hearing my computer running I wonder to myself how I ever dealt with all of the noise before. 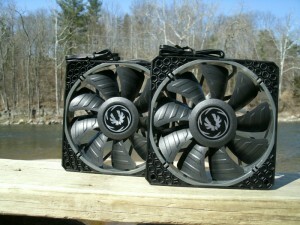 I am ashamed to say that I did not have a 2-fan 120 mm rad to test their performance for the water coolers. 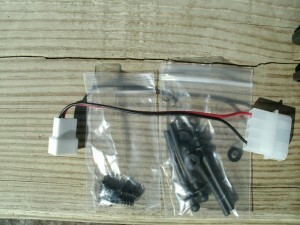 However, I did order one and it should be directly, as such I will post a comparison when I have everything set up. Being offered up at $9.95, I believe these fans to be worth every penny. 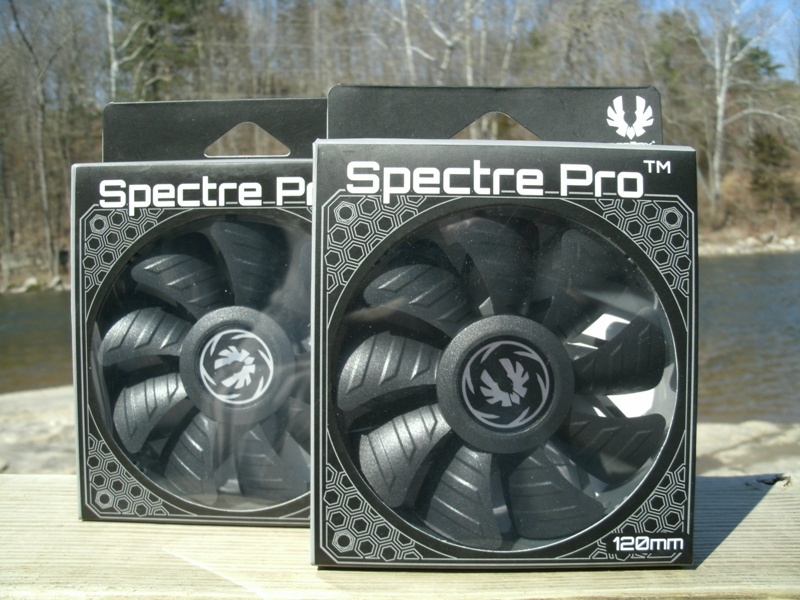 If you are looking for a good fan fan that will provide you the cooling that you need at a very low sound level, then I would recommend the Spectre Pro to you. Heeeeeeeeeeeeey... I actually WAS looking for a review of these.